Our doctors are trained as both dentists and orthodontists. They are licensed in Saskatchewan as certified specialists in orthodontics and their practice is limited to providing orthodontic therapy. Dr. Anholt and Dr. Yaremko are both graduates of the College of Dentistry at the University of Saskatchewan and both worked for multiple years as general dentists. As good friends, they were honored to be selected in the same year to a 3-year full-time Master’s program at the University of Alberta. 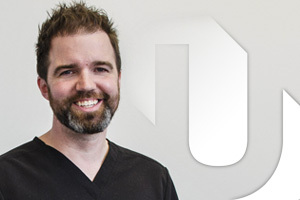 In 2012 they returned to Saskatoon with their respective families and built their dream office - Uptown Orthodontics. As a team, we’ve been growing ever since and we’re now very proud to be the largest orthodontic office in Saskatoon - a true destination center for all forms of orthodontic care! No referral is required to meet with one of our doctors but a scheduled consultation appointment is. Check out our doctors’ individual profiles below to learn more about each of them! 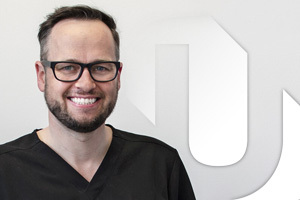 Dr. Devon Anholt is Saskatoon born-and-raised – in many ways he has been born-and-raised in the dental industry as well. Throughout his 10 years of post-secondary studies, Dr. Anholt was involved in numerous leadership roles in sport, politics, and volunteer activities. He strives to continue to be a leader in his community when he is not at Uptown Orthodontics. Dr. Anholt has been a full-time faculty member at the University of Saskatchewan’s College of Dentistry since 2007 (including a 3-year educational leave); he enjoys meeting new students and staff every year and spends countless hours sharing his knowledge and experiences in both lecture and clinical environments. Dr. Anholt has long been a part of Northern Saskatchewan’s Cleft Lip and Palate Team at the Royal University Hospital and currently is the chief orthodontist on this multi-disciplinary team. Dr. Anholt also has 2 years of experience working in Saskatoon as a general dentist alongside many highly-respected clinicians. Dr. Anholt cares passionately about Saskatoon and enjoys supporting local businesses as much as possible with his wife, Kaylen, and daughter Quinn. He feels strongly about maintaining a strong sense of community (generally and professionally) as Saskatoon grows during this time of economic prosperity in our region. Ask Dr. Anholt about anything, be it the latest indie music, shoes and clothing trends, mountain biking, photography, or the NHL/CFL/PGA. He’d be happy to hear about what interests you! Born and raised in Yorkton Saskatchewan, Dr. Brent Yaremko’s interest in orthodontics began in high school when he received extensive orthodontic treatment including orthognathic jaw surgery. Upon completion of his treatment, he was utterly astounded at the improvement of not only his bite but of his facial appearance and confidence level as well. This drastic improvement made such an impact in his life that he was truly inspired. It was at this point Dr. Yaremko realized he wanted to be able to help others and influence their lives in the same way. After completing his dental degree from the University of Saskatchewan in 2006, Dr. Yaremko completed a general practice residency (GPR) at the Royal University Hospital where he was involved in many hospital-based programs including his involvement with the Cleft Lip and Palate Team. Dr. Yaremko then practiced as a general dentist for two years in southern Ontario before moving to Edmonton to complete his three-year Masters of Science Specialty degree in Orthodontics at the University of Alberta. During his specialty training, Dr. Yaremko focused his research on the effect orthodontic appliances have on airway and its influence on growth and development. Dr. Yaremko has enjoyed teaching various aspects of dentistry to dental students, hygienists, and dental assistants. He continues to share his knowledge as a clinical instructor with the University of Saskatchewan dental students on a weekly basis. He also travels biweekly to Regina to help serve the orthodontic needs of southern Saskatchewan. Dr. Yaremko and his wife, Sarah, have four small children, Jordan, Benjamin, Oscar and Wren who are the joys of their lives. When he is not in the office or with his family, Dr. Yaremko enjoys playing the drums, tennis, as well as playing/coaching/watching/talking hockey. Both Dr. Anholt and Dr. Yaremko have successfully completed their national board examinations for Fellowship in the Royal College of Dentists of Canada (RCDC) to be recognized as Certified Specialists in Orthodontics and Dentofacial Orthopaedics in Canada. As well, both doctors are active members of many dental and orthodontic organizations, including the Canadian Association of Orthodontics, American Association of Orthodontists, and the Pacific Coast Society of Orthodontics. They are both members in good standing in the College of Dental Surgeons of Saskatchewan and the Canadian Dental Association. Brace yourself for the possibilities.